When you’re an adjunct English professor you go where the job takes you, which explains why Georgia Thackery is in one of the snowiest parts of Massachusetts teaching at the Falstone College of Art and Design. For the last semester Georgia has been away from her parents, daughter, and their dog Byron teaching Expository Writing to aspiring young artists. Skyping with her family is starting to wear on Georgia, so when she receives an unexpected delivery on her doorstep it’s met with delight. It’s not everyone who can mail themselves in a box to another town, but not everyone is an animated, sentient skeleton. Best friends since Georgia was a child, Sid remains her most trusted and compassionate companion. So she’s delighted to have Sid around for company, even when he wakes her up in the middle of the night to take her to the scene of a nearby accident. It is not until the next morning that Georgia learns the young woman killed was Kelly Griffith, an instructor at FAD and head of its Writing Lab. Using the prize of a much sought-after tenure position as bait, the head of the English department lures the without-benefits-or-respect adjunct professors into takings shifts at the lab as they one-up one another and curry favor. Georgia’s willing to add another task to her already full agenda as it allows both her and Sid to go through Kelly’s files and question her students. She and Sid have perfected the techniques that allow him to (literally) play dead and be sneaked into secured areas, and this time being a non-life model for artists gives him access to the entire facility. Sid and Georgia openly admit that their deliberations include wild speculation, arguing, and asking stupid questions, but it’s a system that works. I absolutely adore this mystery series that should not make sense. There is no explanation for why Sid exists, or why he alone has the ability to function. It is a testament to the author’s skills that readers will not care and embrace the concept. Sid is one of the most delightful, funny, and charming halves of a detective duo. Georgia is a joy as well, battling up through college bureaucracy and staying immersed in the unquestionably unique academic world. Often the only adult in charge, Georgia is flexible enough to accept gender fluidity, not blink at the chapel’s blend of every religion including possibly Klingon’s, and appreciate the artistry of sequential art (otherwise known as comics and graphic novels). The author makes the most of the tiny English department amidst the artistic personalities of the school, yet the humor is never mean-spirited nor crude. Who can resist a heroine who references Firefly, Monty Python, and Harry Potter? Leigh Perry, also known for her mysteries written under the name Toni L.P. Kelner, doesn’t shy away from sentimental moments between Georgia and Sid, complex issues of art ownership, or the line between just annoying and harassment. I never thought I would find the friendship between a woman and a skeleton to be so charming, moving, or enviable. The murder plot is just as complex and unpredictable, making it a winning entry in the always entertaining field of academic mysteries. 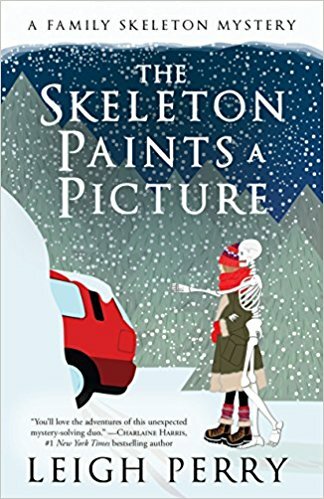 To enter to win a copy of The Skeleton Paints a Picture, simply email KRL at krlcontests@gmail[dot]com by replacing the [dot] with a period, and with the subject line “skeleton,” or comment on this article. A winner will be chosen November 4, 2017. U.S. residents only. If entering via email please included your mailing address. If entering via comment please be sure to include your email address. I so agree with this comment. Sid is a wonder! "I absolutely adore this mystery series that should not make sense. There is no explanation for why Sid exists, or why he alone has the ability to function. It is a testament to the author’s skills that readers will not care and embrace the concept." This is a new series to me. I really enjoyed the synopsis of the book and also the review. Would love to read.